It’s a little amusing that I’m sharing this recipe, because I’ve been to Starbucks once in my life. I was given a gift card so I went to get the Passion Tea and a cookie! I’m not a coffee drinker, and I can’t afford $5-6 drinks anyway, so my money goes to other things that make me happy, like chocolate. Ha! The one time I ordered the Passion Tea I fell in love with it, and then my mother in law started making it for our family dinners. Do you have any idea how easy it is to make? It’s incredibly easy, and it would be a fun recipe to let your daughter make! You only need two simple ingredients for this recipe. I’ve seen other recipes on the web that call for sugar to be added to the tea, but I totally don’t think it’s necessary. 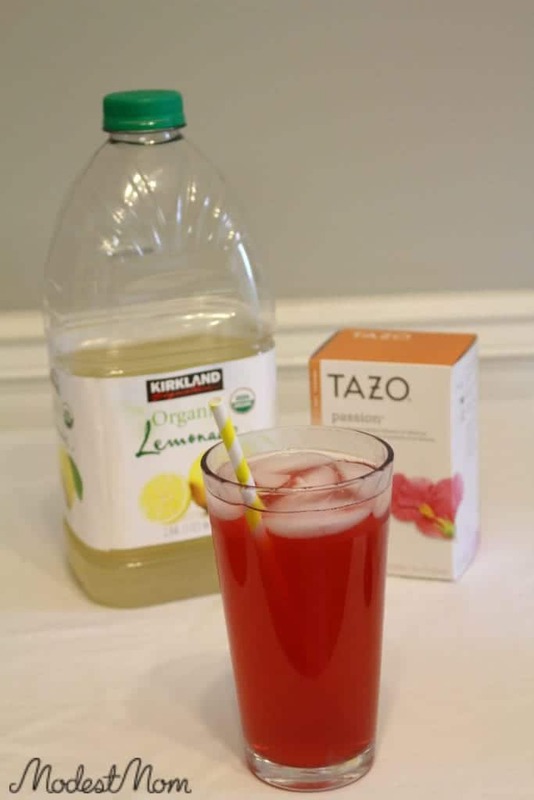 You need the Tazo Passion tea (you can find it on Amazon if you can’t find it locally), and lemonade. Boil 6 cups of water and add 4 tea bags of the Tazo Passion Tea. Turn down to low and let simmer for 10 minutes. You want the water to become really dark red. In a pitcher, pour 8 cups of lemonade, and then add the 6 cups of tea. Let chill in the fridge until cold. My mother in law told me that she has added sprite to this if you want a punch. I’ve had it both ways, but I think I prefer just the basic recipe! 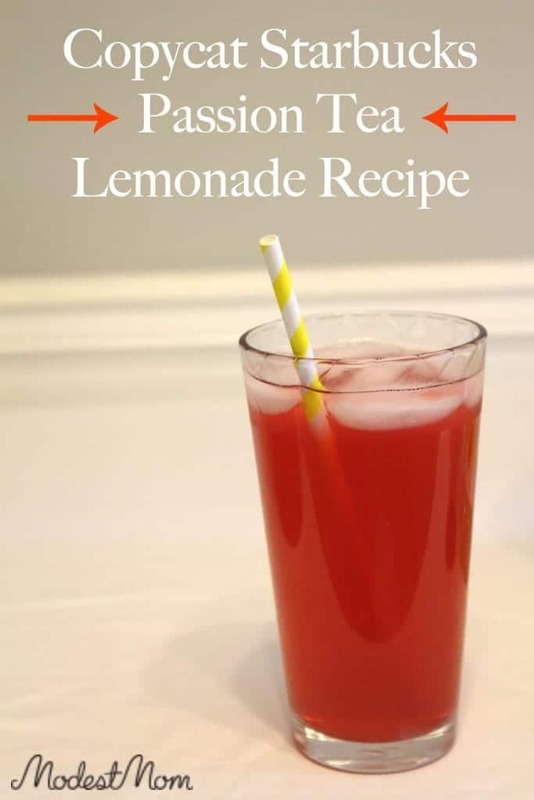 I normally use Simply Lemonade for this recipe, and you can use either the regular lemonade or the raspberry lemonade. 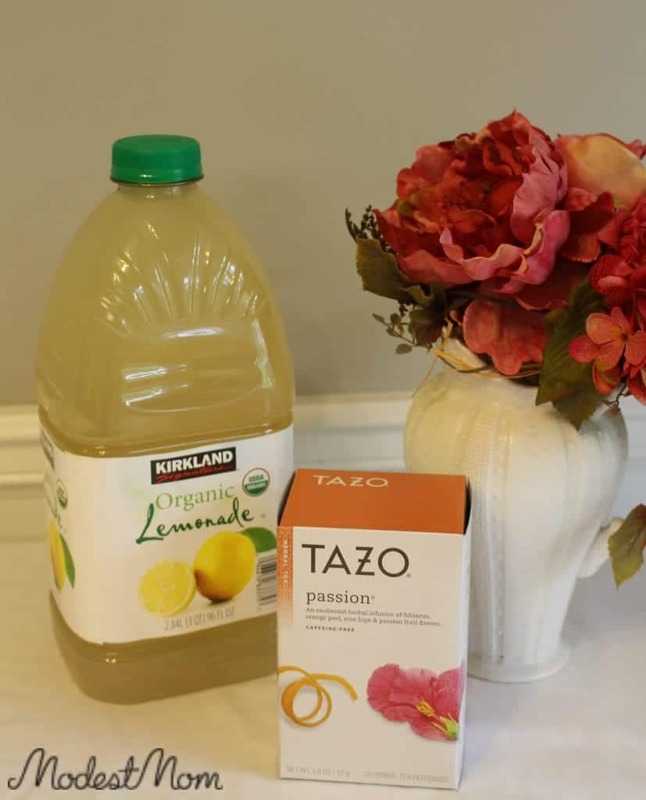 I grabbed the lemonade at Costco this time and I don’t like it quite as well as the Simply Lemonade, but in the recipe I couldn’t tell a difference. Make it on a hot summer day and enjoy!